I've had my share of embarrassing moments over the years, like when I cheated to beat my 7-year-old niece at Candyland, or the time I hazed the Princton University cheerleading squad and pictures of it ended up on the Internet. So, due to my extensive knowledge of embarrassment, I probably understand how the 7-foot Dirk Nowitzki feels after having his potential game-winner blocked by the 6'7" Bruce Bowen. It wasn't just your average, every-day blocked shot, either. It was a full-blown smother chicken, with a heaping helping of ego-ectomy on the side. It seems like only yesterday we discovered the secret of how Dirk stays calm during these stress-inducing situations. So the question is: what was he thinking when Bowen put the clamps on him last night? 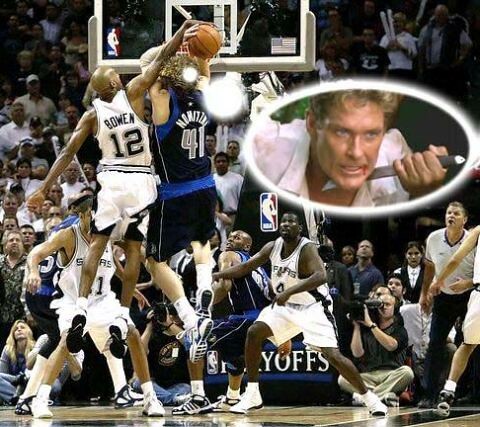 Where was David Hasselhoff when the Mavericks really needed him? "David...Warum hast du mir forsakengeheit??!" All is not lost for the Mavs, of course. After all, they have two more chances to put the series away, and Game 6 is in Dallas. But they let a golden opportunity slip away last night. They played with all the confidence of a team that's up 3-1, and they almost stole another game in San Antonio, where the Spurs have been nearly invincible over the last seven years. But, if history tells me anything, the Mavericks will probably come out stiff and tentative in Game 6. See, by that time, they'll have come to the jarring realization that, if they don't win at home, they'll have to clinch the series on the road...a near impossible feat. The fact is, the Mavs panicked. Dirk rushed that shot against Bowen. Then, two jump balls later, Jason Terry rushed his last-second shot, and Nowitzki rushed the follow-up. Game over. Of course, the Mavericks have a lot to be encouraged about. Tim Duncan was spectacular (he hit his first 12 shots, which tied an NBA playoff record for most shots without a miss), the Spurs were smoking all night (a combined 53 percent from the field), and they got 12 more freethrow attempts. In other words, the Spurs took their best shot, and the Mavs still had a chance to win it at the end. What a series, though! 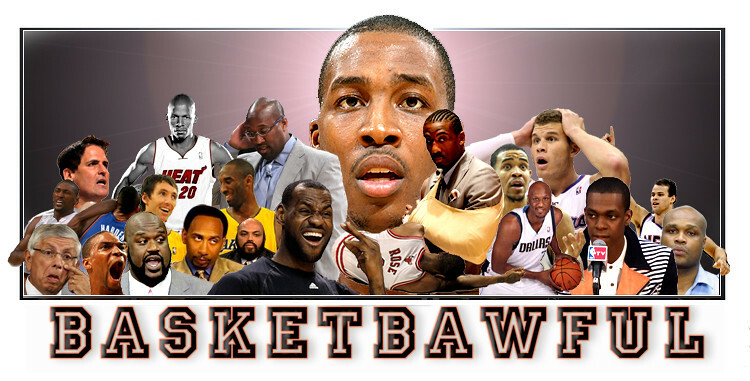 Except for the Game 2 blowout, every game has been a nail-biter. Game 4 was decided by five points in overtime, Game 1 was decided by two points, and Games 3 adn 5 were decided by a single point. This might be the most competitive and evenly matched series since the 1981 Eastern Conference Finals between the Celtics and Sixers. And the circumstances of that series were remarkably similar to this Spurs/Mavs matchup. The Celtics and Sixers were also in the same division, and both teams won 62 games. Boston won the division, but it took three tie-breakers to decide it. The Celts had the homecourt advantage, but quickly coughed it up and went down 3-1. Games 4 through 6 were each decided by two points, and Games 1 and 7 were decided by only one point. And, as everyone knows, the Celtics came back to win the series...and the championship. I'm very interested to see whether history repeats itself. You know that stat that's been thrown around this postseason about how teams down 3-1 lose like 95% of the time? Well, the Suns already came back from 3-1 to beat the Lakers, and as you mentioned if Dallas doesn't close out SA at home, they're basically screwed for game 7. So how is it that 95% of the time teams down 3-1 lose? Most of those must have been the favorite with the 3-1 lead going home for game 5, but it makes you wonder.